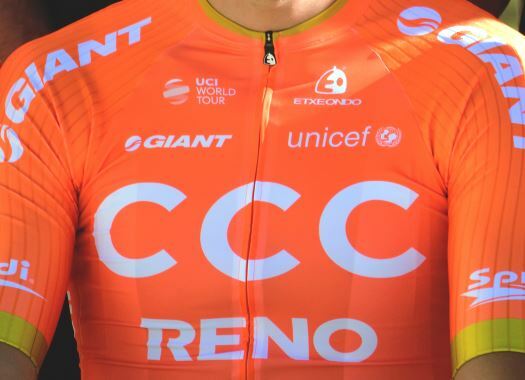 CCC Team's Patrick Bevin has lost the GC lead of the Santos Tour Down Under on the last stage, but he showed resilience and determination in the last day of competition in Australia. Bevin suffered a hard crash in the penultimate stage of the race which caused him multiple contusions. The New Zealander decided to push through the pain and face the last stage of the race and arrived to the finish line at more than five minutes from stage winner Richie Porte. The rider won the second stage of the Tour Down Under and kept the leader's jersey until the last day. But despite losing the victory at the last stage, the rider was received warmly by the public along the route and he took the sprint jersey. "I take the Ziptrack sprint jersey away from the race as a nice result for the week's work," Bevin said. "Obviously, it's tough to touch down yesterday and watch my work evaporate on the GC but that's bike racing. There are no guarantees. We take a lot of positives out of the race and look forward to the next one. "I think someone must have told the crowd that I was Australian today as I had so many fans around the course. I had a lot of support. I had a great time here, an absolute blast coming here and racing from kilometre zero and I plan on sticking to that all year. I'm going to go out and scrap for everything all year. This race really only sets a precedent for what's ahead."